Modern gardens have developed a habit of segregating edible and non-edible plants when there is absolutely no need to do so. Case in point is the stunning garden above with big-leafy chard and purple basil mixed with colorful flowers. The integration is seamless enough that most people probably wouldn’t spot the edibles. This technique is known as edible landscaping and we’ll show you how to get started. A diversified garden can expand the amount of edibles grown and is a productive way to maximize small gardens. The more edible plants you grow, the less you’ll need to buy at the grocery store. Think about how expensive fresh herbs are at the store to buy. Gardeners can control the types of chemicals used (or not) on their own plants. The flowering aspect of edible plants attract butterflies, bees and other beneficial insects which help pollinate the rest of your garden and maintain a natural eco-system. Edibles such as catnip, marigolds, sunflowers and petunias serve as natural pest control for bugs and critters. Did you know that marigolds can help repel slugs off of prized tomato plants? Growing food locally is trending as it saves on energy it takes to transport food from the farm to your table. Kids (and neighbors) will think it’s cool, because it is. The most important consideration is to make sure that non-edible and edibles have the same light, soil, nutrient and water requirements. Most edibles require at least 6 hours of sunlight per day as well as consistent moisture. Herbs are the exception as most can be fairly drought-tolerant. 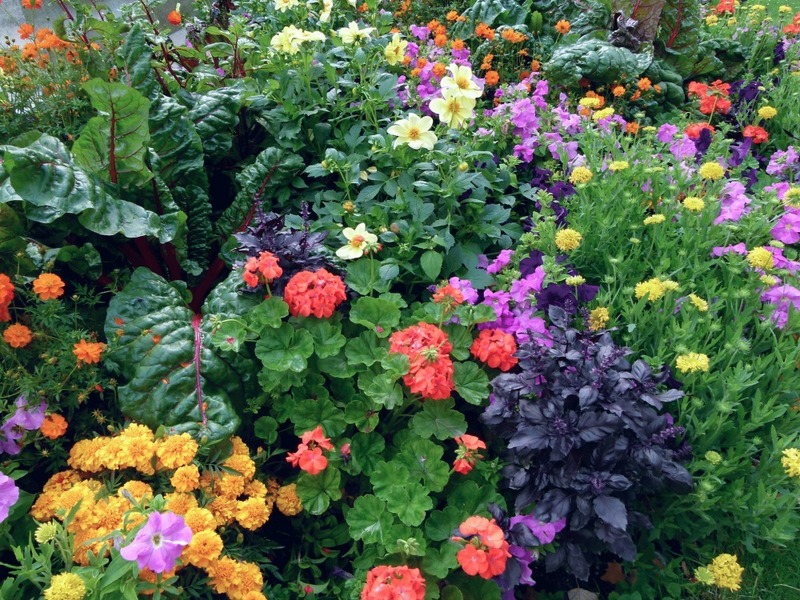 Think about the visual appeal of your existing garden and find edible plants to match. Do you need to soften the hard lines of a flax plant? A small-leaf thyme can do that. Is there a specific color you need? How about a hedge of blueberries. The options are virtually limitless. Don’t forget that bare spots in container plants are also great places to plug in edibles that won’t overwhelm the rest of the container, like dwarf varieties. Those who prefer a minimalist or modern yard style versus the bushier English garden look can still integrate self-contained edible plants such as lettuces and some herbs. They can be planted in diagonal rows or in patterns of alternating colors, for example. Start off with disease-resistant plants and keep in mind any wildlife you have nearby that may want to munch on it. Bunnies and deer like fruits and vegetables, too. 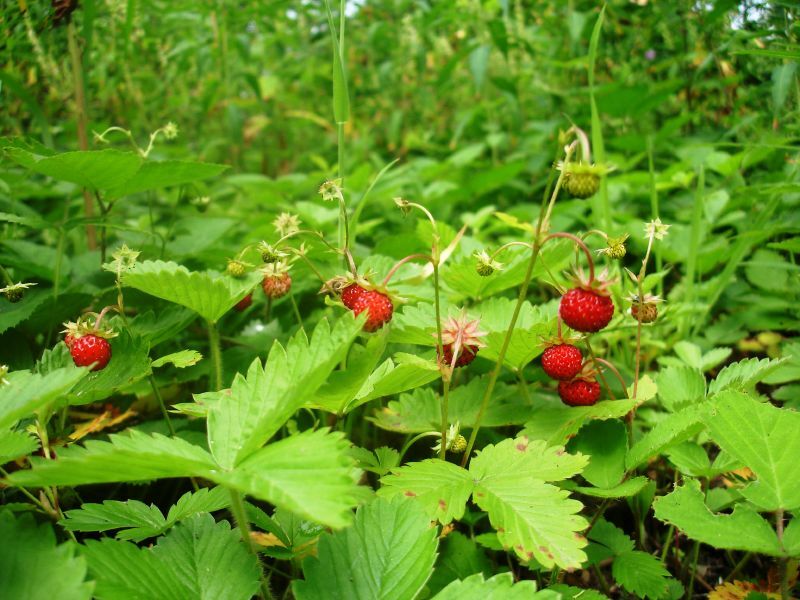 Low-growing edibles like strawberries can plug in holes beneath trees and shrubs or even be used as border plants. Go with the large fruit variety that we commonly buy at the store, or consider smaller alpine strawberries (pictured above), which don’t shoot out runners so they stay relatively contained in small clumps. One of the most beautiful examples of edible gardening I’ve ever seen involved several rows of loose leaf lettuce–each row a different variety–bordering a lawn. Leaf texture and color can vary so dramatically, but you’ll need to keep in mind that the lettuce will eventually be harvested and what the space may look like after the fact. A classic spring combination for some gardeners involves planting tulips against loose leaf lettuce. If you’re going to plant a tree, why not make it a productive one? Lemon and lime trees make good choices for small yards while dwarf varieties can even thrive in containers. They could also be the answer to spaces that are in need of a good focal point. Basil is almost a must in an edible landscape. 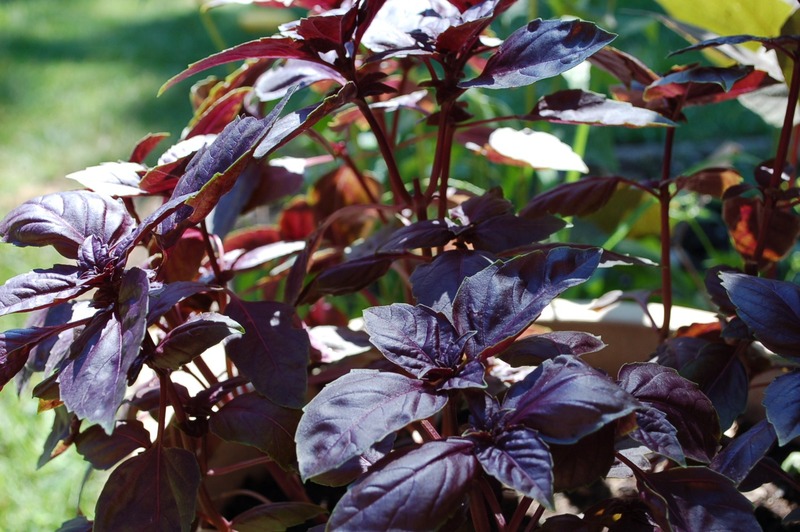 In addition to being a fairly low-maintenance plant, the bright green or purple leaves can be show-stoppers. It does have a lifespan, however, and will need to be replanted. But its beauty and uses in the kitchen will be worth it. Remember, it’s also a trending cocktail garnish. Keep in mind that there is a wide range of rosemary options. Some grow up to 5′ tall while others creep and look gorgeous hanging over the sides of containers. Some have blue flowers while others bloom white. Which you choose is based on where it’s needed. It is a fairly low-maintenance plant in Southern California. The variegated yellow/green leaves of lemon thyme and golden lemon thyme add a simple pop of color and looks spectacular next to purple basil or any other plant of contrasting color. 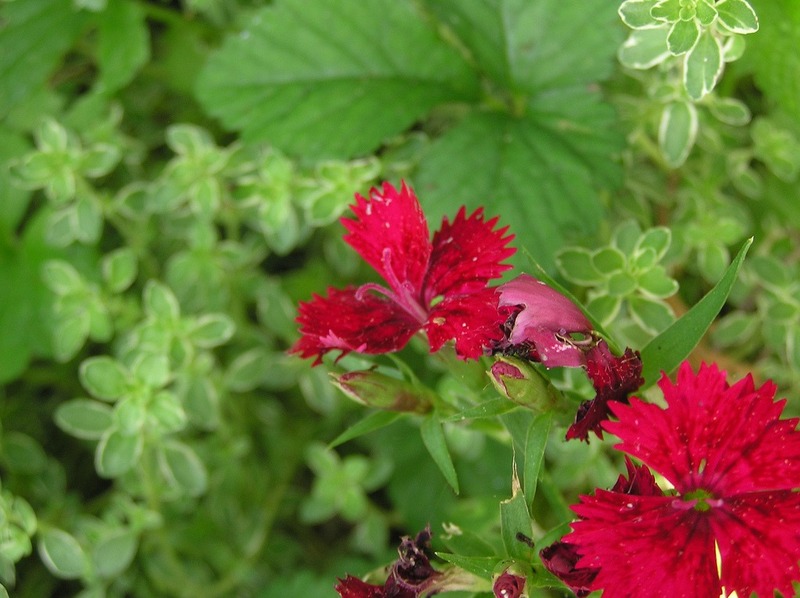 It’s low-growing so perfect as a border plant and seen here paired with a red dianthus flower. Adding sunflowers to an existing flower garden not only adds height and edible seeds, they serve as natural pest control by drawing aphids off other plants. Since they’re best planted by seed, delegate this one to the kids who will love watching them grow. 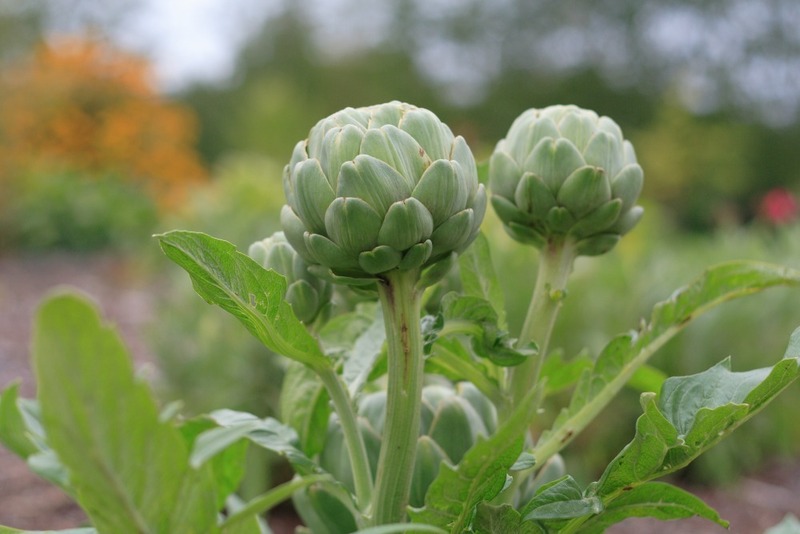 Believe it or not, artichokes are easy to grow provided that you have a 4′ space to house their expansive leaves. They are an incredible way to add architectural interest to a front or back yard. Try using it as an edible ground cover near annual flowers. It’s thought that planting rosemary at the base of a rose plant will help increase the rose’s fragrance. You’ll want to harvest it often to keep it from flowering. Not too many pests will bother it. The pretty gray-green leaves with splashes of purple on tricolor sage make it an excellent border plant. Combine it with big purple succulent rosettes and purple basil for a truly striking combo. Plus, it smells divine. I have it planted with dog-friendly ground cover dymondia and next to garlic–all plants with roughly the same color palate. 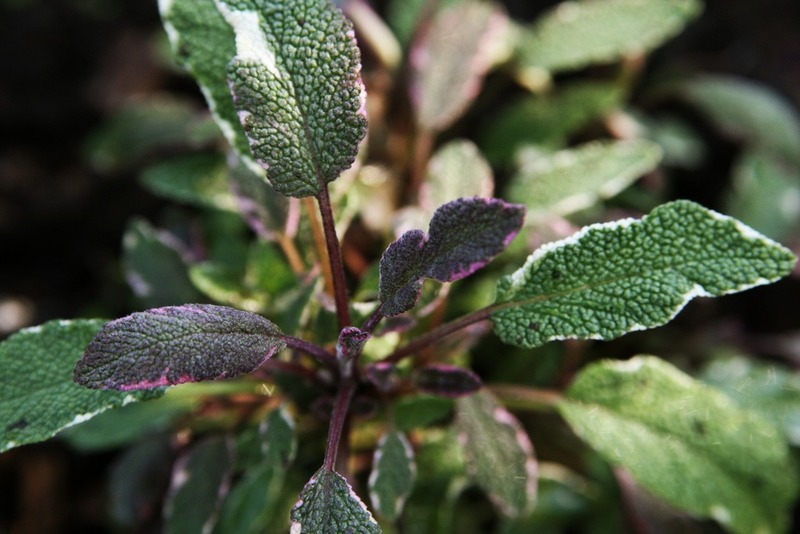 Purple and other sage varieties make excellent choices, too. Most of us don’t have a blank slate to start with, but that’s OK. Create a cohesive look in the garden by adding in opposites. Border a vegetable garden with a low-growing ornamental such as marigolds. Or, surround your rose garden with basil, which has the same growing requirements. It’s important to adhere to spacing requirements in order to make sure surrounding plants have enough circulation as some edible plants, like rosemary can get quite large. Consider which edibles might do best in the backyard such as vegetables with foliage that deteriorates rapidly. How do you mix edibles in with your current landscape?